I never intended to know anything about computers. Eight years ago when my husband, Bill, went back to school to get his master's degree, computers were different. The machine he worked with was a giant residing in a giant-sized apartment in another building. Now, that was a computer that fit its brain. I have trouble trusting a computer that doesn't even fill up the top of my coffee table. Particularly when it can convert my grandmother's recipe for chicken and dumplings into proportions large enough to serve the entire Boy Scout troop faster than I can get my pencil to my lips. That's my beginning thinking position for math problems. You can't see a computer puzzling away. 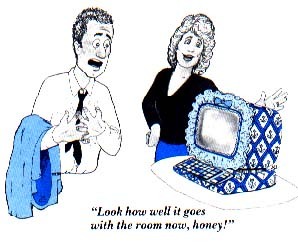 That big computer didn't try to be chummy or even slightly user friendly either. Bill had to take courses to learn its alien tongue. And then to get it to perform any tasks, he had to spend long hours putting his messages on punched cards. These he fed into a card reader -- a go-between machine that decided if the message was in a form worthy of the computer's time. Whether the program worked or not, when the computer was done with the punched cards, they were still useful. I was teaching fifth grade at the time, and I loved to save up boxes full of cards for Christmas. Sprayed green, spindled and stapled, they made wonderful wreaths. What can you do with leftover printouts? Not a lot. Those were quieter, more peaceful times. Disks were still used by strong-armed men in olympic competitions and keyboards were played by musicians. My house wasn't filled with beeps and blips, pops and peeps. Pac-Man hadn't been born yet, let alone taken a wife, had a baby and become supercharged. No one was concerned about defending Earth from communist mutants from space, safely guiding a frog to a lily pad or building burgers -- unless they worked at the local fast food chain. My watch still needed to be set and was perfectly capable of gaining or losing time unexpectedly. Machines never talked to me. They certainly never called me on the phone to ask my opinion. Just a few short years ago, computers fit the old adage "bigger is better." Now, a little computer is faster and has more memory than its giant ancestors. Who knows how many computers I'm really living with? There's the one I can see with its disk drive, its monitor and its keyboard. But what about the little special-purpose computers that each do only one job. They're hiding in my dishwasher, my microwave oven, my car's engine, my camera. There has been no stopping it. Byte by byte, I've become computer literate without ever planning to. I first realized what was happening to me when I started putting slashes through my zeros. When my son used the wrong word in a sentence the other day, I told him he had a "syntax error." When the girl at the deli sliced the smoked turkey breast too thin, I told her there was a "type mismatch." When a car suddenly pulled in front of me on the expressway, I felt automatically for a firing button on the knob of my stick shift. So okay, computers are no longer super giants that are kept in separate buildings and used by specially trained technicians. They're small enough and cheap enough to be brought home and simple enough for me to use. I can live with that, but I'd like to make one request to all the many computer manufacturers. Could you please give those machines some style. I mean, do we have to go through the Model T stage again? Can't I have my home computer in early American with ceramic knobs? Or at least, how about some color? I'd like the case in something besides drab -- something that would go with the wallpaper in my family room. Can't my computer come in wild plum?